Seek the LORD while you can find him. Call on him now while he is near. ‎7 Let the wicked change their ways and banish the very thought of doing wrong. Let them turn to the LORD that he may have mercy on them. Yes, turn to our God, for he will forgive generously. ‎8 “My thoughts are nothing like your thoughts,” says the LORD. “And my ways are far beyond anything you could imagine. ‎9 For just as the heavens are higher than the earth, so my ways are higher than your ways and my thoughts higher than your thoughts. Previous blog posts on this passage have focused on the distinction between the ways of God and the ways of man. Today, however, we would like to emphasize the opening exhortation from verse 5 to “Seek the Lord.” This expression appears in the Psalms and elsewhere as a reminder of where our focus should be as believers. Seek the Lord and his strength, seek his presence continually! [Effective Prayer] “Keep on asking, and you will receive what you ask for. Keep on seeking, and you will find. Keep on knocking, and the door will be opened to you. For everyone who asks, receives. Everyone who seeks, finds. And to everyone who knocks, the door will be opened. This celebrated passage reveals that seeking will be rewarded, as expressed in the lyrics to this song shown as an acrostic poem that spells out the word “ask,” the first three letters of which form the three verbs found in verse 7. Sow for yourselves righteousness, reap the fruit of steadfast love; break up your fallow ground, for it is the time to seek the Lord, that he may come and rain salvation upon you. Trust the surety of His promises, and you will succeed. Keep your ears near to the lips of God that you might clearly hear. As a good shepherd provides, the Lord, our God, supplies each need. Continue to move ahead as pioneers on a love frontier. God is always speaking that we might not only hear but heed. Fight the good fight of faith as you stand to the end: persevere. This particular translation recognizes that in the Greek New Testament the three verbs are expressed in the present progressive tense: meaning keep on asking, keep on seeking, keep on knocking. In the same manner that a child will keep asking for a treat while shopping with his or her parents, Jesus Christ says to continue to ask, continue to seek, continue to knock. In the Bible, eating with someone was a most intimate act. One did not eat with strangers or those outside his most intimate circle of family and friends. In that light, Revelation 3:20 takes on even more significance as an invitation to intimacy. Luke 24 speaks of Jesus and the disciples on the Road to Emmaus and of their breaking bread together, a time of intense intimacy when Jesus opened the eyes of their understanding that they might understand the Scriptures. This unfolding of Himself as revealed in the Scriptures occurred during a meal, a time of wonderfully rich fellowship and intimacy. Keep on asking and it will be given you; keep on seeking and you will find; keep on knocking [reverently] and [the door] will be opened to you. For everyone who keeps on asking receives; and he who keeps on seeking finds; and to him who keeps on knocking, [the door] will be opened. The passage brings to mind a scripture memory song whose lyrics reveal an acrostic poem that spells out the word “a-s-k,” the first three letters of which express the three verbs found in verse 7. In thinking about the passage from Matthew 7:7-8, especially in the Classic Edition of the Amplified Bible, we recognize that in the Greek New Testament the three verbs are expressed in the present progressive tense: meaning keep on asking, keep on seeking, keep on knocking. In the same manner that a child will keep asking for a treat while shopping with his or her parents, Jesus Christ says to continue to ask, continue to seek, continue to knock. The passage from Luke 11: 9-10 and Matthew 7:7-8 brought to mind an acrostic poem that spells out the word “ask,” the first three letters of which form the three verbs found in verse 7. In a prayer notebook that I once had, I recall having a card with the words “Ask God” on one side and Matthew 7:7, 8 on the other. Count your blessings with every ticktock of the clock. 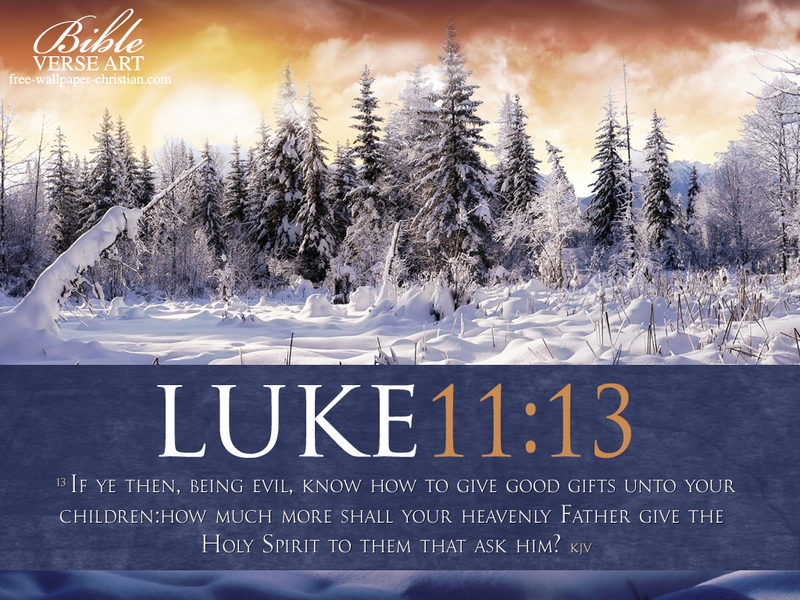 The context of the statement made by the Lord Jesus Christ is found in Luke 11: 1-13 where he teaches what it means to pray. Here we find Jesus Christ praying in a certain place, and when he finished, one of his disciples asked him to teach them how to pray, “as John also taught his disciples.” The Lord goes on to teach them what has become known as the Lord’s Prayer. He goes on to offer an illustration of what it means to pray in Luke 11:5-13. A key component of prayer is asking, which is emphasized in verses 9 and 10, leading up to verse 13. The passage from Luke 11: 9-10 and Matthew 7:7-8 brought to mind a scripture memory song that I composed more than 10 years ago. The arrangement of the lyrics shows an acrostic poem that spells out the word “ask,” the first three letters of which form the three verbs found in verse 7. In a prayer notebook that I once had, I recall having a card with the words “Ask God” on one side and Matthew 7:7, 8 on the other. The Verse of the Day for January 22, 2015 brought to mind a scripture memory song composed more than 10 years ago. The arrangement of the lyrics shows an acrostic poem that spells out the word “ask,” the first three letters of which form the three verbs found in verse 7. In a prayer notebook that I once had, I recall having a card with the words “Ask God” on one side and Matthew 7:7, 8 (KJV) on the other. In thinking about the passage from Matthew 7:7-8, I recognize that in the Greek New Testament the three verbs are expressed in the present progressive tense: meaning keep on asking, keep on seeking, keep on knocking. In the same manner that a child will keep asking for a treat while shopping with his or her parents, Jesus Christ says to continue to ask, continue to seek, continue to knock. In thinking about the two passages, I recognize that in the Greek New Testament the three verbs are expressed in the present progressive tense: meaning keep on asking, keep on seeking, keep on knocking. In the same manner that a child will keep asking for a treat while shopping with his or her parents, Jesus Christ says to continue to ask, continue to seek, continue to knock. The Verse of the Day for January 22, 2014 brought to mind a scripture memory song that I composed more than 10 years ago. The arrangement of the lyrics shows an acrostic poem that spells out the word “ask,” the first three letters of which form the three verbs found in verse 7. In a prayer notebook that I once had, I recall having a card with the words “Ask God” on one side and Matthew 7:7, 8 on the other.